We're an Exhibitor at the Mid-American Truck Show 2019! We’re an Exhibitor at the Mid-American Truck Show 2019! Yes, you indeed read that correct! Just Like you, we are really excited to be a part of one of our Country’s most iconic trucking shows that is been hosted every year, It’s nevertheless the Mid-American Trucking Show (MATS) 2019. Besides, what keeps us more excited is that we are honored to meet & serve our ever hard working members of the Trucking Industry as we have enrolled to be an exhibitor to explain our services and capabilities during the upcoming 2019 MATS show. The 2019 edition of Mid-America Trucking Show (MATS) will be held at Kentucky Exposition Center, Louisville, KY beginning 28th, March 2019. It’s a 3 day event to witness the entire industry’s presence to see what is currently trending in the Trucking, the Recent Technological Updates to streamline enhanced operations across the industry, & to listen to Expertise Reviews on the Trucking Business and so on. Truckdues.com, an IRS authorized electronic return originator to e-file the Federal Tax Form 2290 (Heavy Highway Vehicle Used Tax Return) has been serving our nation’s largest economy contributor (Trucking) over the last 5 years, at very honest unique pricing $7.99 understanding the fact that how hard it is to be a trucker and work tirelessly to meet the nation’s demand. They almost leave their loved ones behind to serve our nations demand on-time. During the show, you may find us, Truckdues.com a product of Jeevan Technologies Inc. at Booth: 66125. In order to extend our gratitude towards the ever hard working trucking community we intend to offer freebies like cool t shirts, key chains and other accessories with embraced trucking lines. You may also refer to the printed show directory which would help you to manage your time effectively throughout the show. You can find the show timings over the course of its tenure as stated below. We look forward to building a strong business relationship in the future with your HVUT Form 2290 needs. See you soon at the MATS 2019. Keep Trucking, Keep Moving America Forward. 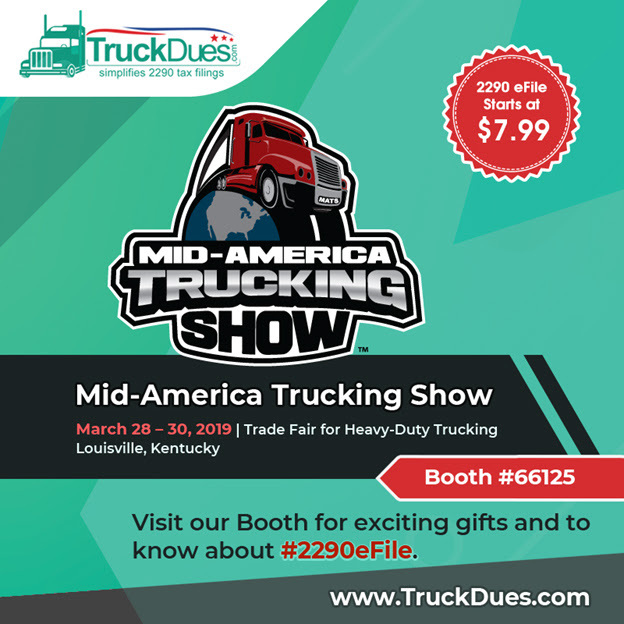 This entry was posted in 2290 e-file, EIN, Truck Tax Online and tagged Form 2290, Form 2290 e file, IRS, MATS 2019, MATS 2K19, Mid-American Truck Show, Trucking Events on March 21, 2019 by Truck Dues.